Is your church following the directives of Leadership Network? If you don't know, you might want to find out. The latest push from this global organization is a book, A Year With Peter Drucker. Before your elders pick up a copy, you might want to ask them what they know about the influence of Peter Drucker. If that name is unfamiliar to you, Drucker is known as the father of the seeker-friendly megachurch business model that treats Christians as customers. Drucker's "Big Three" proteges are Rick Warren of Saddleback, Bill Hybels of Willow Creek Association, and Bob Buford of Leadership Network. If you’ve ever used the words decentralization, knowledge worker, management by objectives, or privatization, you’ve been influenced by Peter Drucker, who coined all of them – and more. In the church world, if your ministry has been impacted by Rick Warren and Saddleback Church, Chuck Smith and Calvary Chapel, or Bill Hybels and Willow Creek Church, then you’ve also been influenced by Drucker, who developed a significant mentoring relationship with each of these leaders and organizations. Drucker (1909-2005), who described himself as a “social ecologist,” was also a personal mentor for more than 25 years to Leadership Network co-founder Bob Buford, whose most recent book, Drucker & Me, highlights Drucker’s relationship to Leadership Network and to various evangelical church leaders. Events sponsored by Leadership Network often featured Drucker as a speaker, offering opportunities to meet with Drucker in small groups over shared meals. Now for those who want to dig deeper into Drucker’s writing themselves, a new book, A Year with Peter Drucker: 52 Weeks of Coaching for Leadership Effectiveness, makes Drucker’s ideas accessible in bite-size excerpts. The author is longtime Drucker associate Joseph A. Maciariello, who Bob Buford describes “the authority on Peter Drucker” – quite an accolade given Drucker’s four million word output spanning 39 books, dozens of scholarly articles and hundreds of newspaper essays. The book has received positive reviews, such as the The Wall Street Journal. 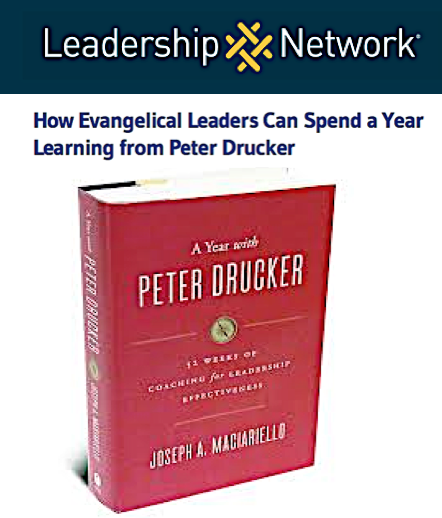 Heady but consistently insightful, it offers a top-flight one-book overview of the core coaching that Drucker gave to many evangelical leaders.